The general opinion about pharmaceutical companies is quite negative. Media inform us daily how they are trying to make profit out of people’s diseases. Also the lobbyism pharmaceutical companies are practicing is often criticized since by doing it, they influence lawyers and politicians in their own favor. Without any doubt, some of these accusations may be true. But to get a less black-and-white opinion on that topic, it might be helpful to know how the pharmaceutical industry operates and which characteristics of it could serve as a justification for that behavior. First, the industry is highly competitive. The oligopoly structure due to high investment costs is a barrier to entry for new firms. But even the dominant players change the position of the biggest companies every few years. When patents expire and generics enter the market, companies are suffering huge revenue losses. Sometimes mergers or acquisitions are the only acute solution: Pfizer, for instance, after the expiration of the patent for Viagra, acquired Wyeth, a manufacturer of vaccines. Adding vaccines to its portfolio, enriched Pfizer with a new business unit. Also, GlaxoSmithKline is merger of three companies. We see, the nature of business is different than in other industries. The mentioned patents are also crucial. Pharmaceutical companies face very high R&D costs. The investment for finding a new drug are very high and only a very little number passes all stages and are finally approved as drugs. These new blockbusters have to make up for the costs of all other potential drugs which did not pass all phases of the test. In that context, the pharmaceutical industry also faces stricter regulations than other industries. In Germany, for instance, a recent law requires companies to prove that the new drug adds more value to the quality of life of the patient than the previous drug. Easy marketing tricks become nearly impossible. The restrictions in terms of advertising are also another barrier for the industry. In many countries the promotion of prescriptive drugs is not permitted. Furthermore, it is often criticized that pharmaceutical companies pay very high salaries. But on the other hand, only the best managers and chemists and pharmaceutical engineers are suitable for these high responsibilities. In fact, often the money might be coming from the wrong sources. Instead of trying to find a cure for Alzheimer or cancer, pharmaceutical companies prefer to invest in slim pills or other diet medicine which is a quicker more lucrative business. Some journalists even go that far stating that pharmaceutical companies do not try to fight e.g. diabetes since they are making huge profits by selling insulin. But that is also only one side of the truth. The discovery of a vaccine or cure for one the diseases like cancer, HIV, Alzheimer or diabetes could bring the company high profits by making them the only one with the patent – a new bestseller. All in all, yes, some criticism is justified. But in order to get a clearer picture, this comment aims at showing some difficulties and special characteristics in the pharmaceutical industry. Categories: Health Economics, Innovation in health care, Pharmaceuticals | Permalink. Warning: Decrease in R&D productivity. Reasons and drivers behind it. The pharmaceutical industry has faced one of the biggest waves of patent expirations in history, a phenomenon referred to as the “patent cliff”. For instances Lipitor (Pfizer) – the top sold drug in 2010 worldwide (IMS Health Top 20 Global Products) – had expired in 2011. 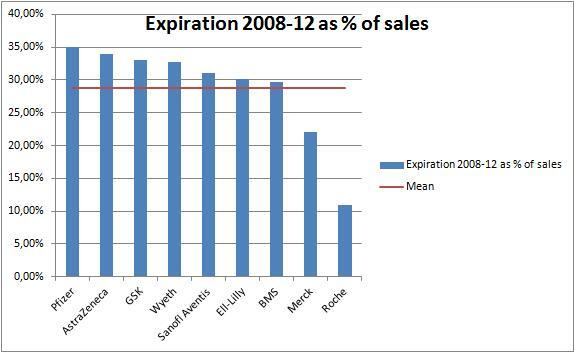 In numerical terms the patent expiration will peak in 2012 and the overall cliff corresponds to around 29% of top pharmaceutical incumbents’ sales. This would not be such a big threat if new, profitable products had been placed in the market by drugmakers. However R&D productivity has decreased from 1995 onwards. R&D expenditure has doubled from 1995 to 2008 while new molecular entities (NME) have plunged by 40% (Datastream). A NME is a molecule developed in the early stage of drug discovery, therefore it’s the first step of drug development. They used to introduce three to four new drugs in the market yearly, nowadays they struggle to produce one. To emphasize the worse, the sales of each drug from 2005 onwards have declined and the cost of developing a new drug has increased. A drug used to generate sales of $515 million per year and then they did an average of $430 million (less 15%). The increase on costs to develop a new drug is due to the increased complexity and the need to run more trials. Given this, we face the end of the blockbuster business model (blockbuster is a drug that returns more than 1 billion US dollars per year). The main reasons for this phenomenon are the current standard of care in many diseases, increased attrition and absence of diagnostic drugs, broaden R&D, unfulfilled management expectations and risk profile. Standard of care: Nowadays most disease categories are well supplied with safe and effective medical goods. The marginal benefits of each discovery are reduced to the eyes of patients and physicians. Adding to this, the science itself is more challenging – degenerative conditions such as Alzheimer’s are not diseases with common symptom profile or etiology. Attrition: Attrition rate is defined as the percentage of compounds that pass through all clinical trials and safety tests. It is estimated to be a rate of 0,01%. The reasons are that regulatory agencies (e.g. Food and Drug Administration) have been stricter in safety criteria and again the standard of care. When we have relatively safe and effective drugs as today, becomes harder for drugmakers to show a reasonable ratio of incremental benefit and risk. Furthermore, big pharmas have not invested in diagnostic related drugs fearing that the diagnostic component would add another stage to the clinical trials and complicate the marketing to doctors, narrowing their profit opportunity set. Broaden R&D: In the past, pharmaceutical had looked for research hits. They had a relatively broad R&D scope aiming at achieving a promising discovery, not tailoring too much on which specific type of drug they wanted to pursue. Some call it the “happy accident” philosophy (serendipity). They are reforming and the focus is narrowing though. Some are aiming at immunology, others at neurology and oncology, et cetera. Many questions arise as “will we have a leader in each segment of diseases?”, “Is this change efficient in terms of R&D expenditure?”. Unfulfilled management expectations: Anticipating some of the threats the industry had a reshaping. One of the trends was the massive wave of M&A, with the hope of having astonishing gains of efficiency via economies of scale and synergies in operations and R&D. As Graves and Langowitz (2006) mention, the expectations for the gains in innovative productivity might be overestimated. Another trend was the expectation over biotechnology. AstraZeneca and Roche were the most active players on this field, acquiring biotech companies. The results show that R&D productivity of biotechnology is pretty much the same as a pharmaceutical (Pall, 2008). Despite this, the biotech share in drug development has been increasing. Risk profile: Pammolli et al. (2010) show that drugmakers are taking the chance in risky projects, with unsolved therapeutical needs and unexploited biological mechanisms. The rationale behind this is that risky projects will have less potential competitors and thus higher expected revenues. Acemoglu and Linn (2004) also provide a framework to justify the rationality behind riskier targets. Indeed the pharmaceutical industry is facing huge challenges and has been transforming itself. There is some uncertainty around and nobody is sure what will be the future. Productivity isn’t everything, but in the long run it’s almost everything. PS: Most of the data refers to the United States. The author doesn’t find this particularly worrying due to the dimension of the pharmaceutical industry in America (40% of global healthcare expenditure accounts to the US). For more indicators of low R&D Productivity please see Pammolli et al. (2010). Acemoglu, D. and Lin, J. (2003) Market size in innovation: theory and evidence from pharmaceutical industry, the quarterly journal of economics 119(3), 1049-1090. Graves, S. and Langowitz, N. (2006), Innovative productivity and returns to scale in the pharmaceutical industry, Strategic Management Journal, Volume 14, Issue 8, 593-605. Categories: Economics, Health Economics, Innovation in health care | Permalink.